Summary of today’s show: Local Catholic businessman Andy LaVallee lives his faith 24/7, bringing his Catholic values into LaVallee’s Bakery Distributors, which provides high-quality breads to feed the poor and homeless; puts employees, customers, and vendors above the bottom line through Gospel values; and has now started a new initiative providing free nutritious bread to anyone who wants to fast for Lent (LiveTheFast.com). In addition, Andy helped found the Massachusetts Catholic Business Association, bringing together Catholics in all fields and walks of life to pray, learn their faith, and join in fellowship on a regular basis. 1st segment: Scot wished all the listeners a happy St. Valentine’s Day. He discussed today’s topic of living the social gospel in how we conduct all our affairs, including our business life. Our guest is Andy LaVallee, owner of LaVallee’s Bakery in Waltham, which gives its first rate bread to many of the food pantries in the area and how he has made the Gospel central to his work. Andy said it’s a 35-year-old family-owned business. They bring in products from all over the world, cakes, cookies, breads and distribute them to top hotels and restaurants. Most of the products come from vendor partners all over the world. He grew up in Charlestown in the busing era. He found a job at a bakery to keep himself out of trouble. After about eight years, his wife was pregnant with their first son, so he bought a station wagon for a few hundred dollars and started delivering bread on the way home. LaVallee’s had a different vision of who they wanted to be, to have top-level service. Their breakthrough was delivering to the Château and Nocera restaurants. Andy said you have to be totally committed if you’re self-employed and through the first 15 years he put in a lot of long hours. The turning point was in 1997, when he was leaving Mass and Fr. Rodney Copp asked him to teach CCD to confirmation age boys. He promised to do it for one year and ended up doing it for 13 years. He learned a lot about Catholic social values and how to treat people. It transformed how he lead the company and gave him the idea of servant leadership. He said in the beginning, he went to Mass, but had no other faith life. He said he’s a Triple type-A personality so he attacked teaching CCD in the same way and wanted to make sure he was teaching these kids the right thing. Andy said the first thing to know is God’s love and how his grace and mercy works in us. He used examples from their own lives to explain the Church’s teachings. By recognizing how blessed we are by God and we are created with a purpose makes us want to reciprocate for what we have been given and to find out what our mission is. He wanted to be an example of these teachings, not just for the CCD classes, but also for his own family. He had an interview with a young man for a driver’s job. They’d had trouble keeping drivers working for them. At the end of the interview, he asked him why he wanted to work there. The man said God had told him he wanted him to go work at LaVallee’s. That told Andy that he wanted to run his company that way. Instead of living by the spreadsheet, they wanted to live by the truth of the dignity of every human being. The way that works is that you have to show the love of God through your actions in all your business dealings. Vendors and customers can then trust you. He also continually focuses his people on the values of the dignity of the human being. Be more concerned with the people first and everything else will happen if you live by the rules God gave us. He doesn’t call his drivers “drivers”, they call them customer guardians. They set up a special program to teach them that their job is to watch over their customers, be the best teammate they can be, and be a step above everyone else delivering to business in Boston. That has led to double-digit growth in this economy. Not everyone is Catholic. Only about 50% are. But they all understand the Christian values and know they are treated better than any place else. They pay their health insurance. They allow employees to bring their newborns to work with them rather than send them to daycare. When you walk into LaVallee’s, you see the LaVallee’s logo and an portrait of Pope John Paul II, who is the example of servant leadership. Everyone in business wants to climb to the top of pyramid. But to be a success, you have to invert the pyramid. You have to support everyone who trusts in you and believe in you. How did Christ build the Church we are today? By being a servant-example to all. It’s so much easier to do it this way because you just live according to these teachings. When you finish a task, you say you’ve done the best you can and leave the rest up to God. There is a whole process in forming other managers in the company to this model. Lead by example and walk through the ideas with them on a day by day basis. Scot asked when Andy realized he had a responsibility to provide high-quality breads to the poor and homeless. Andy said in meetings with vendors, there would be cases and cases of product that get thrown out because they don’t meet a particular customer’s standards. They take that high-quality bread to shelters throughout Boston. On one Thanksgiving day, you would find the same exact bread on the tables at the Ritz Carlton as found on the tables at St. Francis House right out the back door of the hotel. Andy’s accountants complain about the cost, but they are building spiritual equity, not to mention gaining a positive response from others who want more of that bread. A few years he founded with some others an organization called the CEO Council on Hunger to provide high-quality foods to the poor and homeless. 2nd segment: Andy has started a website called LivetheFast.com, which discusses breads created for fasting. He said bread and water is the best fast: water is cleansing and bread represents the Eucharist. But 90% of the breads in supermarkets would accelerate your appetite that would prevent you from completing the fast by making you hungry: sugars, preservatives, etc. Jesus fasted and taught his disciples to fast, but no one has tried this commercially. Families used to make their own breads at home to fast. They’re doing this commercially all-natural, whole wheat, unbleached, no preservatives, and providing nutrition to maintain the fast all day. He has selected from among 600 products for his best fasting bread. It is an artisan roll, handmade, but with different flavor profiles. The cranberry multi-bread pecan is good for breakfast. The ancient grain bread is a soaked grain so it’s easier. They have a nut grain and even a white/whole wheat mix for kids. Once you sign up for the Lenten challenge at the website, they will also provide some great books and other resources to help you live the fast. He learned through this discovery of fasting breads, during all the apparitions of Our Lady, she has recommended we fast and pray. Andy was on a pilgrimage to Medjugorje a few years ago. In the middle of the night he heard some Italian women singing the rosary outside his window so he got up to pray with them. 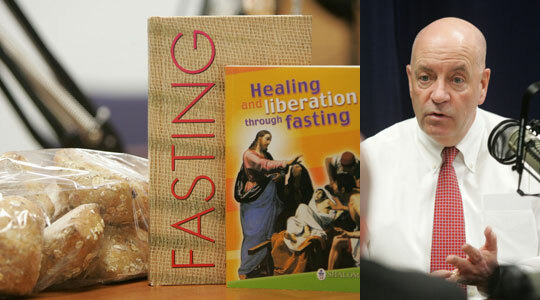 He had been fasting on Wednesdays and Fridays and the idea of fasting breads came to him and the idea stayed with him. He went back to Medjugorje five months later and researched their fasting practices. They use similar breads as he’s making. They use a spelt flour that’s hard to get in the US, but almost everyone fasts when they are there. Andy intends to provide the breads to anyone who wants to live the fast. Got to LivetheFast.com, sign up for the Lenten challenge, and they will provide the breads throughout Lent. Put them in your freezer, take one out before going to work and heat it up in the oven for a few minutes, take a bottle of water and go. When he’s fasting, his focus level is entirely different. He’d read that when you fast, you lose energy and look different, but he wanted to make the breads nutritious and not lose energy. But his prayer life remained focus and he doesn’t get too many lows. If someone signs up for the fasting challenge, people will be able to pick up the breads in various places and at different times. There will enough for a few weeks at a time, but you can come back for more for all of Lent. Cardinal Seán recently called us to pray and fast with regard to the Health and Human Services mandate so this can be part of that. Scot asked if Andy has internal projections on how much they’re going to be giving out. Andy said they don’t have projections, but he’s hopeful it will be very popular. 3rd segment: Andy has been asked to speak at St. Mary, Waltham, after Masses about the value of fasting and he’s hoping they get a lot of parishioners who want to take the Live the Fast challenge. A few years ago, Andy and some other Catholics formed the Mass. Catholic Business Association. Andreas Widmer is a friend and mentor to Andy and helped him found it. He got the idea while driving home one day from a Legatus meeting. He wrote a whole business plan for it and then presented it to Andreas. He said he’d been thinking of the same thing. The mission is to come together once per month, be centered around the Eucharist, and then have reflections after Mass and silence. They build the reflections around the liturgical calendar. It’s a great example of what they’re trying to do in the community. They’ll be meeting at St. Francis Chapel at the Prudential Center. They had more than 60 present at their last Mass and they meet after Mass at Champions. One of the priests from St. Clement Eucharistic Shrine will celebrate Mass. It was the OMVs who suggested the move from South Boston to the business center of Boston at the Prudential Center. When they moved last month, they had 12 new people. They consistently hear from them that they never thought they’d find an organization like this. Scot said you can feel lonely because you don’t know other people at your workplace who share your faith. The next meeting is March 7 at 5:45pm with Mass at 6pm, reflection at 6:30pm, silent meditation and then dinner and fellowship from about 7pm to 9pm. Andy said the reflections are given by one of the members of the group. they give a School of Prayer, taking either the liturgical calendar or readings for the day and bringing into their daily lives, their work or family or community. There is no cost to be a member. It’s men and women and the ages range from college age all the way up to their 70s. There are great opportunities to mentor. And it’s everyone from the janitor to the CEO.